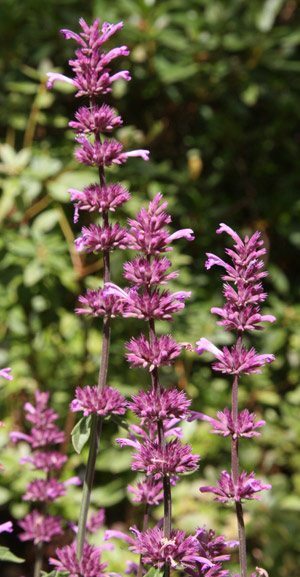 Agastache with tall spikes of flower in summer are a stalwart for the dry garden. With more varieties available each year these easy care plants grow well in a sunny position and well drained soil. These perennials not only have a long flowering period, they also have fragrant foliage. Maintenance is minimal, simply cut them back to the ground in early spring. 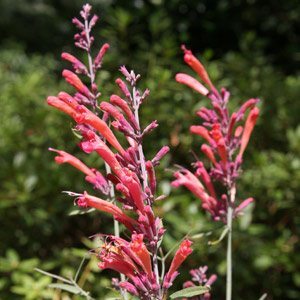 The flowers also attract bees and birds to the garden, the plants are frost tolerant, and are also reasonably drought tolerant. They can be grown in the garden as feature plants, planned en mass or even grown in containers on patios or in courtyards. Choose a sunny position and a well drained soil and you are off to good start. Dig the soil well, removing weeds and adding some well rotted compost. Mulch around the plants to retain some moisture and prevent weeds. Fertilise each spring with a liquid seaweed and fish emission fertiliser. Top dress with a little compost each year. You can dead head after the fort flush of flowers to promote more flowers. Prune back to the ground in early spring. You will see the new growth around the base os the plant, leave this in tact. A number of species and many cultivars are available. The species vary in height and form and are a guide to the growth habit of the cultivars. Agastache aurantiaca has orange flowers. A. foeniculum or ‘Blue giant hyssop’ . A. mexicana is a tall growing plant to 1.2m although sometimes shorter depending on soil and growing conditions. Also known as ‘Mexican Hysop’. Sweet Lili – Violet and Apricot Coloured flowers. Easy by division of established clumps. Divide every 4 – 5 years, look for the sections that are newer in growth and replant these. Divide into good sized clumps with 3 -4 shoots on each one. The older sections are best disposed of.